Was cloudy here this morning as well, the coastal "June Gloom" has decided to befall us a bit early this year. So no Mercurial transit. Last night, set out with my Onesky and the ES82 4.7 as well as a celestron omni 4mm that I picked up over the weekend in a thrift shop for about 5 bucks. I Was at first worried the ES 4.7 might e a bit on the heavy side, but it all balanced out just fine. Between the 2, I would say that I could eek out just a bit more with the 4mm, but it was a pain to use, had to mash my eye up against the eyepiece, bumped the scope a lot, and just wasn't very comfortable. What I really appreciated about the ES 4.7 was the eye relief. I could still wear my glasses and get good views in the center of the field and kind of look around from outside of it. I have a very mild astigmatism and so wearing glasses for observation is better than not. Something I noticed was that when looking at particularly bright objects at higher powers the image looked a bit grainy, for a lack of a better term. I would move my eye's position relative to the eyepiece and the image would appear to move and the grain stationary. Is that a limitation of the mirror, dew, or my own eyes? This appeared in both the Omni and ES eyepieces. Well, I was able to do this with the AWB setup shown in the next picture. Thanks for all the ideas folks. Mercury is the top leftmost black dot. 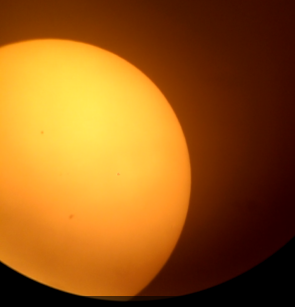 The bottom left is a sunspot, and the thing on the right, in the middle is some crud on the cell phone camera. I clipped this decent frame from a very Blair Witch Project video that my wife got just holding the phone to the eyepiece. Edited by occtipus, 09 May 2016 - 03:10 PM. What I really appreciated about the ES 4.7 was the eye relief. I could still wear my glasses and get good views in the center of the field and kind of look around from outside of it. I have a very mild astigmatism and so wearing glasses for observation is better than not. Regarding astigmatism - do you know what the reading is for your viewing eye? I define mild as .5 or less. This, would show up at very large exit pupils only. Any eyepiece below 22 mm would not show astigmatism given that diopter. If your astigmatism is 1.0, then you are good down to about a 12 mm eyepiece. Your astigmatism would have to be very bad for it to be needed with your 4.7 mm eyepiece (it would have to be at least 3 diopters, which is very significant). The graininess you are seeing is due to the central obstruction, and compounded by the lack of a light shield around the tube. A refractor would be the cure for this. My OneSky project list is 99% complete. I trimmed off a little of the Kydex so the scope tube closes flush when collapsed and I got the focuser fixed up with more Chapstick so the thread slop is history. I bought soft silicone rubber beer coasters that work amazingly well for leveling shims and vibration control. I tweaked the laser finder a bit so it is in the right spot and adjusted the scope balance on the Virtuoso mount and it tracks like a dream. I have been shopping for a SynScan controller upgrade for my Virtuoso mount and was shocked at the price ($300+), So I bought a cheap, discontinued Orion 102mm Mak goto scope that had the new version SynScan controller. I am telling myself I got a goto mount and a 102mm Mak for $40 bucks over the cost of the hand controller, lol. So, as things go, it is raining and I cannot play tonight. I can't wait to use my OneSky with full goto. Sorry to hear that, Dave. I tried once to adjust the center screw and when it didn't turn easily I gave up forever. I have used a 2mm allen wrench to successfully adjust the secondary. The wrench can be a little finicky to get engaged but works fine once it is. once centered, look through the eyepiece hole without the Cheshire, check that the secondary alignment is at least close. I believe viewing eye is at a .5 and the other is .75. As far as the central obstruction and graininess. I Was under the impression that it mostly affected contrast, but not so much resolution. I'm under the impression that the graininess is always there, just that the higher magnification eyepieces just make it more noticeable. The light shield has been on the list of things to do. I ran into obvious glare the other evening with the school across the road, the whole edge of the viewfinder was aglow! Speaking of central obstructions, has anyone calculated the % of the aperture which is actually blocked? When I was certificated to teach, I initially was authorized to teach earth sciences, and took some courses in celestial navigation. I always felt I knew my way around the night sky fairly well. Messing around with this scope has really highlighted that I had just started scratching the surface. So with .5 diopters you should be fine with any eyepiece below about 22 mm. I would recommend not using your glasses, and simply refocus the scope to your correction. Yes, the graininess comes with extreme magnification. Sorry - I was misinterpreting your description there. So another question, for argument's sake, let's say the central mirror is obstructing 20% of the aperature in the Onesky, that would effectively render it 102mm of light gathering. Would the images be similar to those of a 102mm refractor with the same focal length? I know exit pupil would decrease, I'm mostly interested in resolving power. I've read some different resources that say that resolution would be the same, but contrast would be better in a refractor. And sort of an add-on question. My, albeit, limited understanding was that you could push a scope to roughtly double its aperture in mm as far as magnification goes. With that said, the 130mm onesky should be able to support ~260x magnification, a 4.7 eyepiece comes in at around ~138x. But based on results from the previous night, trying to push much harder would just be a failplan. Sure, image would get bigger, but also grainier. I would say that rather than 2:1 magnification to aperture ratio, 1:1 would be a better plan of attack. Or am I missing something? Edited by Xeno, 10 May 2016 - 01:34 PM. So another question, for argument's sake, let's say the central mirror is obstructing 20% of the aperture in the Onesky, that would effectively render it 102mm of light gathering. No, that's not correct. In terms of light gathering, which determines the ability to see faint objects, the central mirror has a very small effect. That's because the light gathered -- or blocked -- scales as the square of the diameter. So a central obstruction of 20% actually only blocks 0.2 x 0.2 = 0.04 = 4% of the incoming light. In other words, negligible. A bigger issue in this regard is that mirrors reflect only about 90% of the incoming light. But taking all this into account, a 130-mm Newtonian still gathers about as much light as a 120-mm refractor. Would the images be similar to those of a 102mm refractor with the same focal length? I know exit pupil would decrease, I'm mostly interested in resolving power. I've read some different resources that say that resolution would be the same, but contrast would be better in a refractor. That's correct. The distinction between resolution is subtle but important. For observing objects with very high contrast, such as craters on the Moon or splitting double stars, aperture is all that matters. Planetary features all have low to very low inherent contrast, so any extra loss of contrast is a big deal. A first-rate 130-mm Newtonian is roughly equivalent to a first-rate 102-mm refractor for planetary observing, but superior to the refractor for all other purposes. The 2:1 rule applies only to high-contrast targets. For planets, something like 1.5:1 is a better bet, even with absolutely first-rate optics. The OneSky has good optics -- very good for the price -- but certainly not as good as a Newt can get. More to the point, it's limited by its mechanics -- the crude focuser and decent but not great mount. In practice, I wouldn't enjoy using a OneSky much above 150X, maybe 200X in a pinch. I've been to two different Michael's looking for black foam sheet to make a shroud with no luck. They both have every other color. Does anyone see an issue with using another color (gray perhaps) instead of black? The one thing I'd be concerned about other colors is if you're operating around brighter street lights, another color might give your image the hue of your shroud material if there's any light penetrating the material. But black or grey would be fine I imagine. If in doubt a small can of flat black spray paint should do the trick. Tony, thank you for that description, that helps clear up quite a bit about what's going on. Like I said about the other night, my 4.7mm eyepiece seems to be pushing planetary views to the edge of usefulness, the 4mm just made the image, and the grains larger when looking at Jupiter. I've only recently started looking for double stars and such, have to know which are visible from my location, my night sky knowledge is more along the lines of, figuring out where I am, what month it is, and what's the time. I have the ES 4.7mm and as you've noted it is about right at the max useful magnification given the inherent resolution of the OneSky. However, I also have a 3.2 and there can be some benefit to increasing the image size. The downside is also magnifying fuzziness or any other aberration in the image at the same time. I got a less expensive BST 3.2 (TMB clone) because I figured there's not much point in spending money to magnify fuzz. I decided t go that route rather than a Barlow for the same or higher price. I used the 3.2 BST to view Saturn recently and did find it useful in spite of some loss in image sharpness. Thanks everyone, I'll go with gray for now and keep an eye out for black. Thankfully, this is the cheapest and easiest mod to make, so there's no problem trying a few different ways. I found mine at a Hobby Lobby store. Funny you should ask. 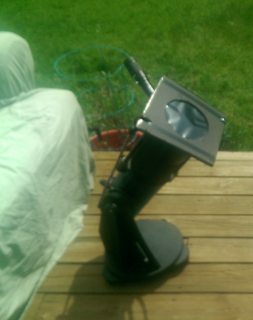 While building my solar setup this week to watch the transit, I finally needed to build that shroud. My wife grabbed a multipack of colors from Michaels. We used yellow foam to make a template so we didn't waste the black. The yellow was not completely opaque when held to the window in sunlight, but the blue was great, the black was great, and I think the green or red would also work (I didn't check). I didn't have grey in the pack, but you could probably test it with a window or bright light at the store. The yellow or white might actually be ok at night if you are not absolutely bathed in nearby light, but obviously wouldn't work for solar observing. Black looks the coolest, so we used that once we got the template made, and had blue and green available as a backup if we screwed up the black. Edited by occtipus, 12 May 2016 - 11:48 AM. Thousand Oaks filters aren't really optical quality. The black polymer they use for eclipse glasses are not very good optically but they're OK for viewing without magnification. The bigger problem is that the glass used for their solar filters for telescopes is not optical quality. Making them from optically ground glass would be prohibitively expensive and I'm not aware of anyone ever doing it for the mass market. Baader solar film is the best available with regard to optical quality. It's easy to make a filter for a telescope from a sheet of it, and there are companies that use it in their filters. Sorry for the bad news there but, really, Thousand Oaks filters are a carryover from when there were no alternatives. Welder's glass is fine for observing the Sun if you use one that's dark enough. #14 is recommended, so the #12 you used is too light for comfort. Note that all welder's glass cuts out all the UV and IR that might harm your eyes so there's nothing unsafe about using #12. It's just going to be too bright for most people. - If too much light enters the eye over a prolonged period of time (chronic exposure over days to weeks), this CAN cause permanent damage - if for example one relies on under #14 welder's glass for solar viewing. - While welder's glasses indeed offer UV and IR, this is only if they are manufactured to specifications - for example in the USA they must be ANSI compliant. So please be careful about what you are using. What Mike notes about glass filters is correct. As an example, I have a Borg 50mm Achro fitted for white light viewing and I fitted it with IDAS ND5.2 filter which is UV and IR treated as well. That tiny filter (52mm if I recall) is $195, so good quality filters are very expensive. However, Baader film is oh-so-close to perfection and it is very cheap. Baader even sells just the film without a cell and has instructions on their website on how to make a cell for the film. Make sure you use the visual version for visual stuff. And whatever scope / combination of filters you use, PLEASE DO check that everything is secured and functioning correctly PRIOR to pointing the scope and viewing the Sun. A blast of wind taking your Baader filter with it would be catastrophic for example. Apologies for the sermon but eyesight is a very precious commodity! Are you still using the bar magnet to balance the OneSky in the Virtuoso mount? Tracking is really the only thing I'm longing for with my OneSky. The Virtuoso looks to be my next purchase.